There are many different variations when it comes to this traditional Italian dish. Some braise the chicken before smothering it with a thick tomato sauce, some bread the chicken and then bake it, some use white wine, and some use red. 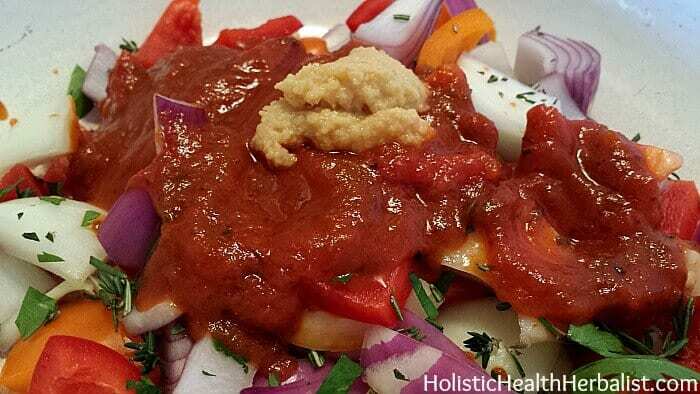 The one thing that they do have in common is they all have similar base ingredients; onion, garlic, fresh herbs, tomatoes, bell pepper, chicken… you can make this with the simplest ingredients and it works with most anything you have on hand. My version of this classic “hunter-style” meal is super simple to make. All you have to do is layer whatever ingredients are available in your kitchen and I have to say, I’ve never made it the same way twice and it consistently comes out awesome every time! It’s a huge favorite in my house… so much so that we almost eat it once a week. 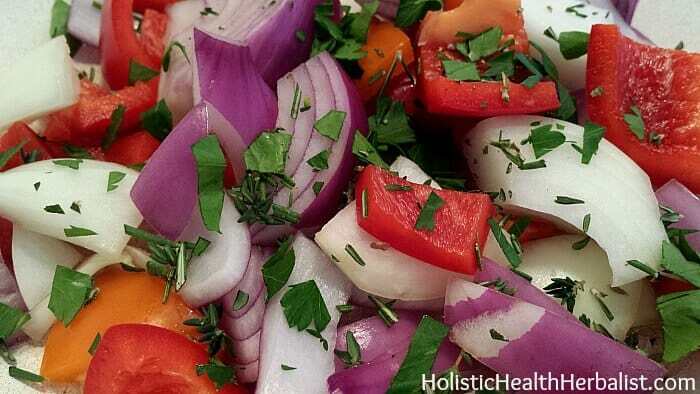 Oil the bottom of your dutch oven or crockpot and layer in some of the chopped ingredients and fresh herbs. Layer on some of the marinara sauce and some of that crushed garlic. Next, layer on some of the chicken thighs. Throw on a bit more chopped ingredients and herbs. Continue to layer on more marinara, garlic, and then the chicken legs. Make another layer with the chopped ingredients and the thighs. Top it all off with marinara. Sprinkle with a nice pinch of celtic sea salt and several cracks of black pepper. Turn up the heat and then lower to a very low simmer for a few hours, covered, until the chicken is fork tender. 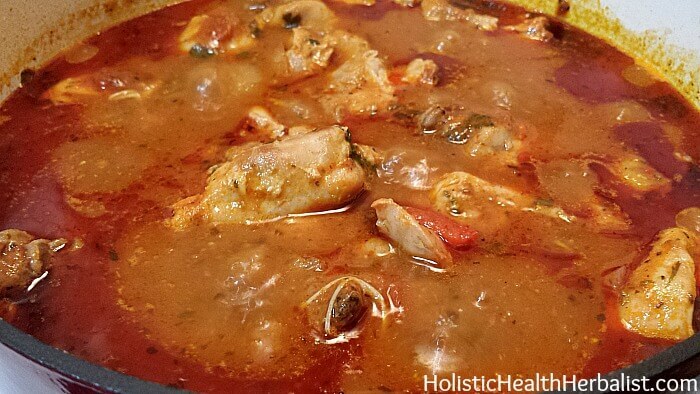 If you’re using a crock pot, turn it to low and let the cacciatore cook slowly for 4-6 hours. 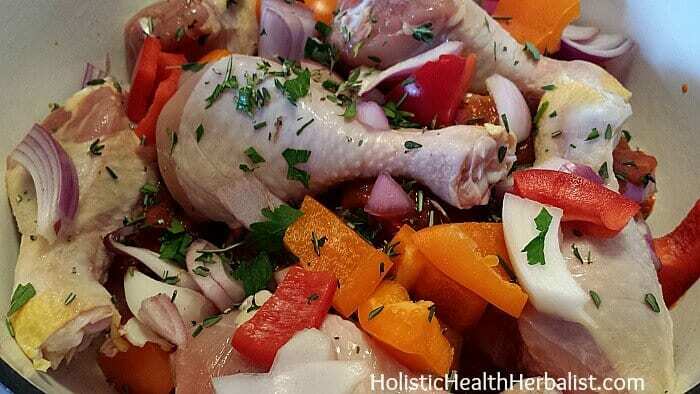 You will not need to add liquid, though you can add homemade bone broth, stock, water, or even another dash of wine to make it thinner at the end. Always taste for seasoning if you do this. I always prefer a thicker stew that is easy to ladle on mashed potatoes without too much juice. ***A note about using chicken legs. The meat will literally fall off the bones and can be tricky to fish out if you let the stew cook for a long time. It can be rather unpleasant to find gristly pieces and tiny bones, so please think ahead and fish them out in order to pull off the meat before this happens. I like using legs because they offer some very nourishing qualities to the stew in the form of healing bone broth, collagen and gelatin. 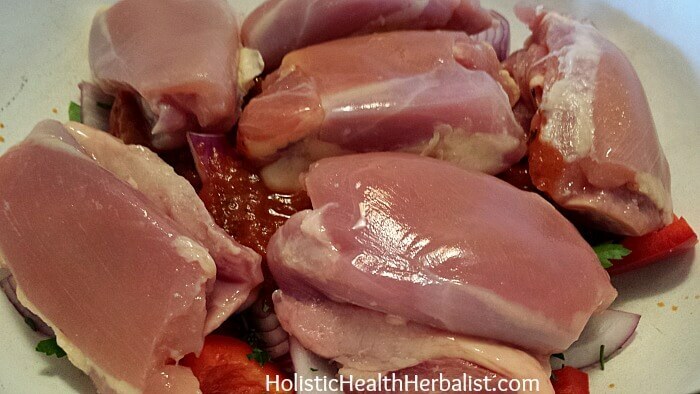 You can certainly omit the chicken legs without losing too much flavor, so don’t worry if you don’t want to use them! This recipe feeds my boyfriend and I for several days, so be sure to cut the recipe in half or more to accommodate yourself or your family. 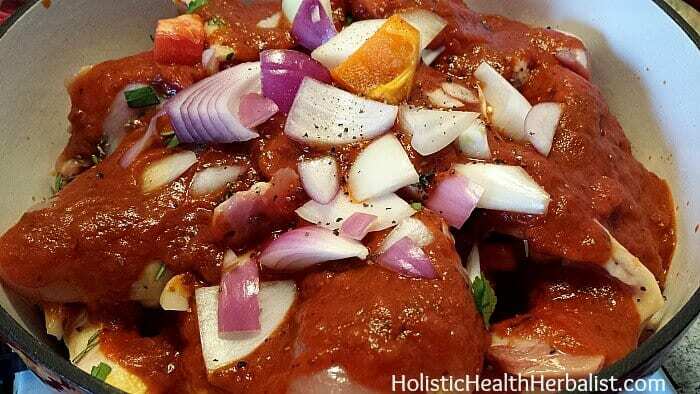 When the meat is tender and delicious, taste the stew for seasoning and add some salt and pepper if needed. Serve over a bed of creamy mashed potatoes, a pasta of your choice, spaghetti squash, rice, or eat just as it is! 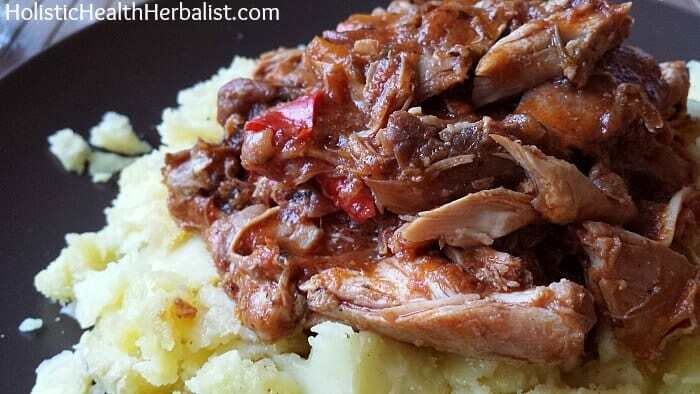 This recipe can even fit the Paleo diet since it’s so diverse. What else can you throw in there? You name it, you can throw it in here. This recipe is a “everything and the kitchen sink” type recipe so play around with it and have fun!